I don't have the professional pictures up just yet, but here are some of ours. Christine and Tyler were married last weekend at the Chicago History Museum. 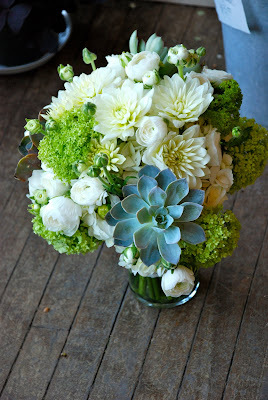 Her bouquet was so full and lush, filled with dahlias, succulents, hydrangea, viburnum and ranunculus. The boutonnieres were created with dahlias buds and root hydrangea. Last minute I added in a miniature succulent into Tyler's because it was so cute and perfectly matched Christine. Event planning was coordinated by Greatest Expectations.